There is one castle of my great castle adventure to Würzburg and surroundings last year missing from Castleholic thus far: the Festung Marienberg high above the Bavarian city more famous for its stunning Residenz. The reason? Possibly that I didn't enjoy it as much as many of the other places during my trip including Schloss Weissenstein which I will never stop swooning about. Don't get me wrong, the Festung is a place of fascinating history and offers greats views over Würzburg but it didn't quite grab me as much. Festung Marienberg, or Marienberg Fortress, served as the residence of the Prince-Bishops of Würzburg for nearly five centuries before being vacated in favour of the more glamorous residence. Construction on the original parts of today's Festung started around the year 1200 but only about 50 years later, in 1253, Bishop Hermann von Lobdeburg made the fortress his permanent residence after his relationship with the people of Würzburg took a turn for the worse and they sided with the Emperor against the Bishop. After 1308, the palas was enlarged under Bishop Andreas von Gundelfingen with the costs paid for by the townspeople to compensate their liege lord for a riot that year. The following decades saw the construction of an additional rings of fortification. In 1525, during the German Peasants' War, Festung Marienberg successfully withstood a siege by peasants led by Götz von Berlichingen, who was later immortalised by writer and poet Johann Wolfgang von Goethe. After taking office in 1573, Bishop Julius Echter von Mespelbrunn reconstructed the fortress and increased the size of the fortifications after a fire in 1572 had damaged much of the medieval castle. Under his reign, the transformation of the fortress into a Renaissance residence, started before the Peasants's War, was completed. Peace was not to stay at the Festung though as the Thirty Years' War held Europe in its grip: In 1631 after some days of fighting, the fortress was taken by Swedish forces under Gustaf II Adolf of Sweden. They plundered the fortress and most of the well-known library was carried off to Uppsala. The fortress was held by the Swedish and their allies until 1635, when the Bishop was able to return. Just a few years later, the princely residence was completely rebuilt and redesigned under Bishop Johann Philipp von Schönborn. After 1708, the palas and church were yet again redesigned, this time in Baroque style. In 1719, the Prince-Bishops left the fortress behind for good and moved their court to a palace in the middle of the city. 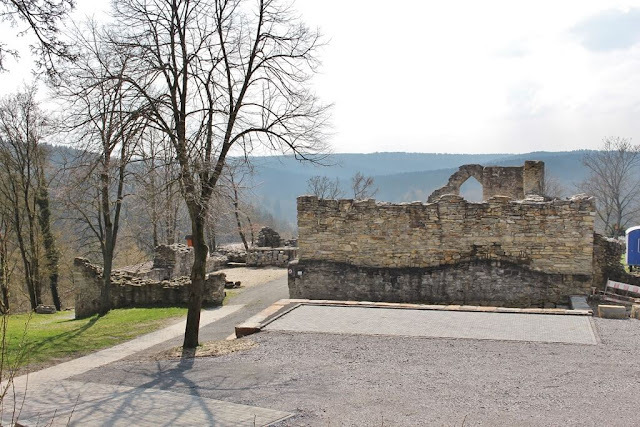 Festung Marienberg subsequently became a military structure and saw repeated action during the Napoleonic Wars. In 1803, the fortress was occupied by troops of the Electorate of Bavaria after the Bishopric of Würzburg was securalised. The fortress changed hands numerous times during the war with French Emperor Napoleon staying there a number of times during his campaigns. The Festung lost its official status as "fortress" in 1867 and subsequently was used as army barracks and a prison camp. During World War II, Marienberg served as a medical depot and towards the end of the war as a depository of cultural treasures. During bombing raids of Würzburg by allied forces, large parts of the Festung were destroyed with reconstruction starting in 1950 and taking almost 40 years to complete. These days, the Festung is home to a museum and while it looks impressive from the outside, its a much more modest affair from the inside. Little of the original rooms and decorations remain but instead the focus is on the exhibits.